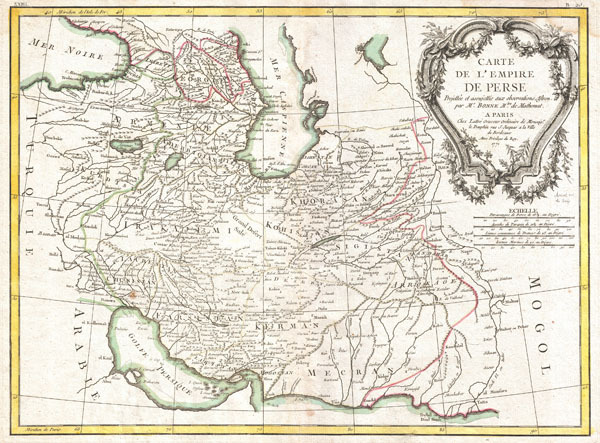 A beautiful example of Rigobert Bonne's 1771 decorative map of the Persia. Covers from the Black Sea south to the Persian Gulf and east past the Caspian Sa to the Indus Valley. Includes the modern day nations of Iran, Iraq, Kuwait, Afghanistan, Georgia, Armenia, Azerbaijan, with parts of adjacent Turkey, Saudi Arabia, and Pakistan. Names numerous tribal areas, villages, cities, deserts, caravan routes, and river systems. A large decorative title cartouche bearing garlands appears in the upper right hand quadrant. A fine map of the region. Drawn by R. Bonne in 1771 for issue as plate no. B 25 in Jean Lattre's 1776 issue of the Atlas Moderne. Very good condition. Original centerfold exhibits minor toning. Light water stain upper right mrgin. Blank on verso. Rumsey 2612.051. Phillips (Atlases) 664. National Maritime Museum, 215.